Happy New Year! I do hope you all had a wonderful Christmas and that 2010 will be a great year for us all. We had a busy Christmas and there was a lot of cooking both Christmas Day and Boxing Day. We spent Christmas at home with relations and then drove three hours the next day and had another Christmas with our youngest daughter on the farm. New Years was a lot quieter and I spent all day on New Years Day in my craft room. (A good start to the year). It was so relaxing and I enjoyed every minute of it. There are only two more weeks left of the Inventory Clearance as it finishes on the 24th January. If you haven't already had a look at the list you dont have long to do it. Its on the right hand side of my blog. All you have to do is click on the icon. There are great savings to be made. Well! We have Sale-a-bration coming up on the 25 January and it runs till 31 March. 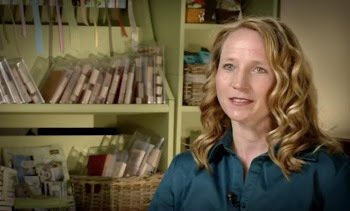 This is where each time you spend $100 of Stampin' Up! 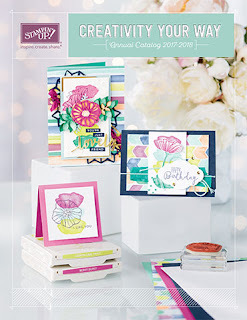 products you will receive a stamp set of your choice from the Sale-a-bration catalogue. If you have been eyeing off some products in the catalogue then this will be a good time for you to purchase them and collect your new freebies. I have used Whimsical Words stamp set. This set has 6 stamps in it and is really lovely and I think will be very popular. First of all using the heart stamp from the Always Stamp Set I took my Not Quite Navy Marker and coloured the edging on the heart. I stamped onto Very Vanilla Cardstock. Then using my Stamp-a-ma-jig I used the stamp from Whimsical Words and stamped on Versamark then Pumpkin Pie and onto the cardstock in the middle of the heart. I then used Clear Embossing Powder and then the heat gun. On the Not Quite Navy cardstock I used the dauber and the Versamark and sponged around the edges. I used Versamark to stamp the sentiment all over the cardstock. 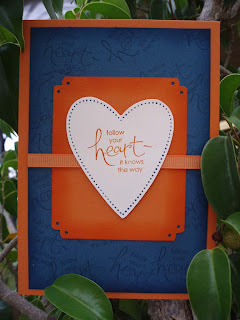 To get the pattern on the small Pumpkin Pie cardstock I used the Eyelet Border. If you place the corner of the card into the eyelet border and centre it in between the patterns and punch you will achieve this pattern. I used Stampin' Dimensionals to raise the heart so that I was able to run the ribbon underneath.